As a new mom I was in for a rude awakening when it came to teething! My newborn was sleeping through the night at 6 weeks old – yes she spoiled me! When she turned 3 months, things took a 180 degree turn. My awesome sleeper was getting up every two hours in the night and the breast was barely consoling her. What in the world could it be? That’s when I felt along her gum line and sure enough there were sharp pieces of a tooth poking through. Who wouldn’t be miserable at that! Poor babies!!! It’s a good thing we go through that at a young age because mouth pain is no joke! I decided to put together our list of teethers we tried and which ones my little one preferred the most! My little one loves this teether most out of all of them. She loves all the textures and it’s easiest for her to hold! I can throw it in a sandwich bag in the freezer to cool it down to soothe her gums. This is her Favorite! 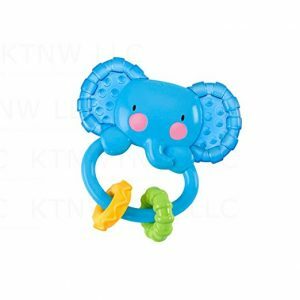 This teether has little rings that babies like to chew on and it can also be stored in the freezer to cool and soothe gums, as well. Also makes a great rattle! Sophie, the giraffe, was a little awkward for my little one to hold even with the rounded edges she seemed to have a hard time holding on to it. Kiki, the elephant, my baby preferred after she got her first set of teeth as opposed to during teething. She liked to chew on it once they came through. 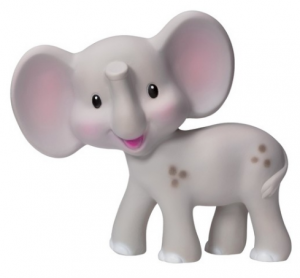 Your little one will love this Squeeze and Teeth Elephant from Infantino GaGa, only at Target. This chewy, squeaky elephant is soft, flexible and easy to grab. It’s made of natural, BPA-free rubber. SweeTooth Baby Teether – The Sweetest Baby Teether Ever! This teether is adorable and smells amazing! For some reason my baby preferred holding it cone side up, I think she likes the texture better. Every SweeTooth is made from medical and food grade silicone rubber. That means it’s naturally free of chemicals and toxins associated with plastic like BPA, PVC, phthalates, and it’s also hypoallergenic and latex-free. 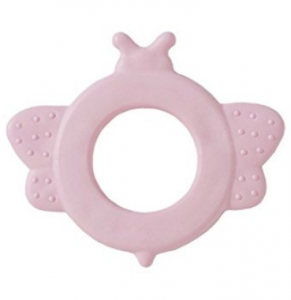 Unfortunately, the Burt’s Bee Teether was my daughters least favorite. Not sure why, but she had a tough time grasping it with the wings. 100% Cornstarch Rubber Bee Teether is made in the USA. If you’re an expecting or new mom be sure to Pin this for later so you can be prepared when your darling starts teething! Disclaimer: Every child is unique. What works for my child may not work for yours, but I am able to offer what experiences I have that work for my child with you. Are there other teethers you’ve come across you can recommend? I’ve had my first (adult) encounter with teething recently! I’m a nanny and my 2 year old was getting his molars in. The parents didn’t let me give him anything because they said he needed to tough it out but i was curious if the teethers work for the toddlers. Frozen washcloths are awesome! Teething is terrible! I’ve had my first (adult) encounter with teething recently as a nanny. My boy is 2 and his molars were coming in. I was curious to see if teethers helped and since hey didn’t have any I went old school and froze washcloths for him to naw at!